Not gonna lie. 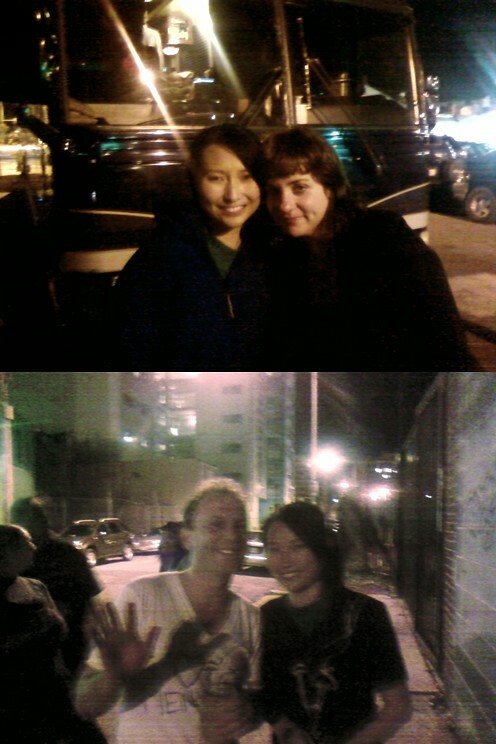 Half the reason I'm writing this post is to show off that I got to meet and take photos with the lead singers (Amy Millian and Torquil Campbell) of the amazing band, Stars (albeit 3 years ago). They're both incredibly sweet and talented people who hugged me and happily autographed my ticket, which I carry around with me to this day trying to decipher Amy's chicken scratch handwriting =p. But seriously, I can't even begin to tell you how much this band has affected my life, though thankfully I was able to tell Amy and Torquil on the night pictured below. When I saw Torquil playing a great show a few nights ago with his other band, Memphis, and realized I'd never shared the life-changing, heart-wrenching beauty of their music with you all, I couldn't get this post up fast enough! I won't go into details, but let's just say that their music has gotten me through a thousand rough patches in my life, ranging from terrible breakups to crappy days. Take my word for it, don't go without Stars in your life for another moment. I recommend starting with the album "Set Yourself on Fire" and then going backwards or forwards. Preferably both. You really can't go wrong either way. Ready? Set...Go! Glad you had fun! I have never heard of this band before but I will check them out. Also, please don't take this weirdly haha but you are so pretty!! I wish my Asian heritage was more apparent. Looks like you had great fun! Its nice that yore sharing this. Anything that has had a great impact on your life is worth sharing. Thank you for introducing this new band. I've never heard of them before... I really dig her voice..and how much... and probably shouldn't say this, but I'm really liking that title..iykwim the lyrics almost fit me perfectly. Sounds like you had a great time..I've never heard of this band before..thanks for sharing! Soo fun Xiaolu!!! I'll just live vicariously through you! I love this post. Joining my non-religious gospel choir this year was absolutely pivotal in reminding me that it's possible to feel happy in life, and enabling me to make the decision to defer the PhD in order to seek challenge and contentment. I absolutely believe in the power of music to lift us up and heal, so ic an't wait to investigate this band! Aw, Xiaolu, how wonderful you could take pics with your favourite band!!! I love stars! And I love this song. The lyrics are so beautiful, I am glad you shared this band with everybody. It certainly looks like you has an amazing time. It is so fun to meet stars! ooh I love her voice! thank you for introducing me to them. She is gorgeous. The film clip reminds me of a scene in Eternal Sunshine of the Spotless Mind. One of my favourite movies. What an amazing time that must've been. I am a huge fan of Stars, too. Every time I hear Calendar Girl I feel like I am living in a movie. It just has that kind of dramatic and climactic feel to it. I agree with Brittany in a totally non creepy way :) you are very pretty! Just letting you know that I have restarted posting recipes on my blog now that Lenten fasting is over! Feel free to check them out when you get time - a stack more are coming - mostly pies!!! I love Stars too. Once I made a mixed cd for someone where I took 1 line from each song on the cd and made it into a sort of poem! They have amazing lyrics and beautiful sound. Food as Art: Introducing Laksmi W.